Hydrofogger�equipped with 230V/50Hz motor for International Customers.� Comes with Multi-Directional Fogging Head.� In Stock for Immediate Delivery. 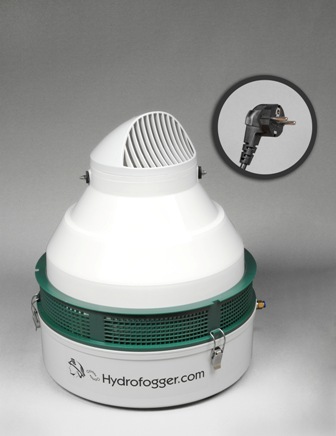 Hydrofogger with Multi-Directional Fogging Head. In Stock For Immediate Delivery. Measures 438mm tall (with fogging head) x 356mm in diameter. Dry weight is 7 kg. Coverage is up to 186m2, depending on humidification requirements and ceiling height. Output is approximately 3.975 liters per hour. Industrial-Grade Motor. Voltage is 230V/50Hz (Non-U.S. plug). Comes with internal float valve to maintain proper water level. Connect directly to your water supply with either our Water Installation Kit, Gravity Feed Water Kit, Garden Hose Connection Kit, or use your own 6mm tubing and saddle valve. Reservoir Pan Capacity is 2.0 liters. Operates at 62 dBA. 1 Year Manufacturers Warranty. Please contact us for orders shipping outside of the United States. Consider adding our 230V Humidistat to accurately control the level of humidity in your desired area. Also, our BioCubes will inhibit the growth of bacteria inside the humidifier for a minimum of 6 months. Our Hydrofogger Air Filters will remove dust and dirt from the air entering the humidifier. Note: Shipping charges are not calculated online for international orders. You will receive an email with your final shipping charges after they have been calculated by your order representative. We then will need your approval to add the international shipping charges before we ship your order. Please email us for the best quote on international shipping.